ACWU02 - The Fighting 69th. The 69th New York infantry in the American Civil War were named the 'Fighting 69' by their opponent General Lee. They were part of the famous Irish Brigade, as all it's members were Irishmen who had signed up to fight for the Union when war broke out in 1861. The regiment deal is made up of 24 figures. 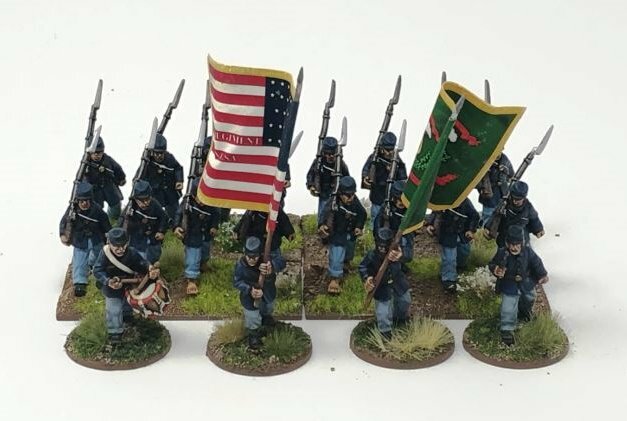 20 figures are from the Crusader Miniatures ACW figures dressed in Jackets and Kepis, including an officer, two standard bearers and a drummer. You also then get four unique models. This is a figure in a jacket and kepi with barefeet. We have taken this design from the painting of the 69th at Antietam Sept 1862 by Don Troiani. In it he depicts young soldiers, who in acknowledgement of their warrior forefathers, had removed their brogues and socks to fight barefoot. All figures are 28mm sized, made of metal and supplied unpainted. This unit deal does include paper flags, made by Flags of War, depicting the 69th two flags. We also include the wire flag poles.